Our truly raw, certified organic Nori is wild harvested from the mineral rich waters of the Sea of Japan. Our Nori is never cultured; it grows naturally in it native environment. Nori seaweed is a universal name for various species of red algae. Raw Nori is dark purple in color - food for the crown chakra! (Green Nori has been roasted.) Our glossy purple-black Nori Sheets are classified as Grade A-B, representing the upper 15% of quality of all Nori production. Nori Sheets are one of the easiest ways to eat seaweed - just use it as a wrap for salads or fill it with sliced veggies and nut pat. For this reason, along with its dense and unique nutrient values, Vivapura has identified it as one of the "Seven Superb Superfoods". It is low calorie and low fat, and extremely high in nutrients, especially riboflavin, vitamins a & c, iron, calcium, zinc, iodine, epa and fiber. 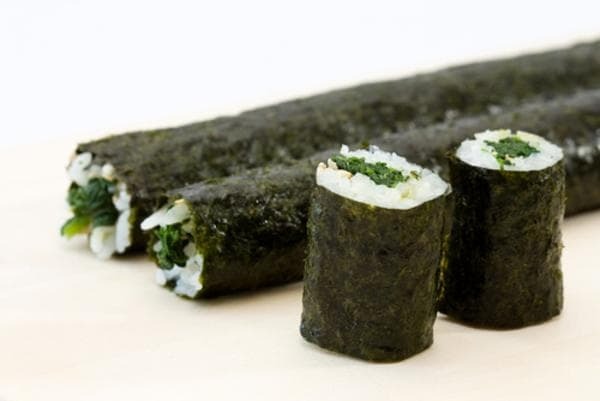 Nori contains as much protein as soybeans, in an easy to digest and assimilate form. It is also a good source of lignans. Our Nori is harvested in Certified Organic Waters in the southern Sea of Japan between Japan and China. 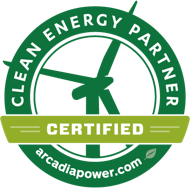 Ecocert, the certifier, adheres to the european organic practices and standards which exceeds the usda requirements for organic programs. To be classified as "Certified Organic Waters" the harvest site must have at least a 3 year history of continuous clean water testing. The Japanese owned factory is located on the Coast of China. From here it is shipped via ocean cargo container out of shanghai directly to the port of oakland ca usa. The Tsunami and Earthquakes which occurred in Japan last March were located in Northern Japan on the Pacific Ocean side. The growing site for our nori is located far to the South in the Sea of Japan between Southern Japan and China in a different Ocean. Further more, the prevailing winds and ocean currents travel from South to North up the eastern coast of Japan across the Pacific Ocean and around past Alaska, Canada, and down the Pacific Coast of the United States. Thus the completely opposite direction away from our growing areas. The growing season for harvesting Porphyra Yezoensis is from early September to early March each Year. All of our product for current harvest year was produced prior to the March events and is currently in cold storage until production. Never the less, water and site testing has been stepped up to include daily radiation monitoring. Vivapura recently received radiological testing as well as copies of clean pesticide / contaminate reports and nutritional information. We are happy to say that everything is testing out 100 percent clean. In addition samples have been tested with an independent laboratory here in the US and have posted 100 percent clean results. 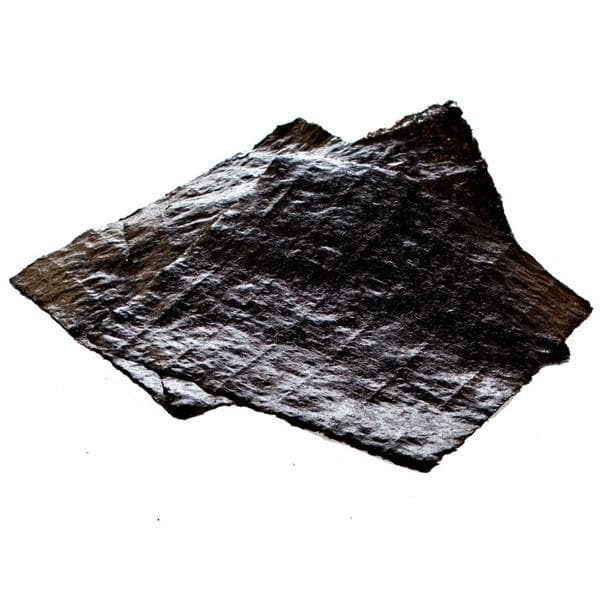 The Truly Raw Nori Production Process: Vivapura's Nori is wild harvested, rinsed, emulsified into a slurry, low-temperature pressed into sheets and placed on screens on drying racks (similar to a paper making process). It is naturally dried in conditions that never exceed 85. (Note: much Nori sold as "raw" has been heat processed at temperatures high enough to destroy vital nutrients). The large dry sheets are then cut into the finished product size and finally packaged. The entire process is carefully monitored by ocai (and international organic certification organization with far more stringent regulations than any regulating body in the us). 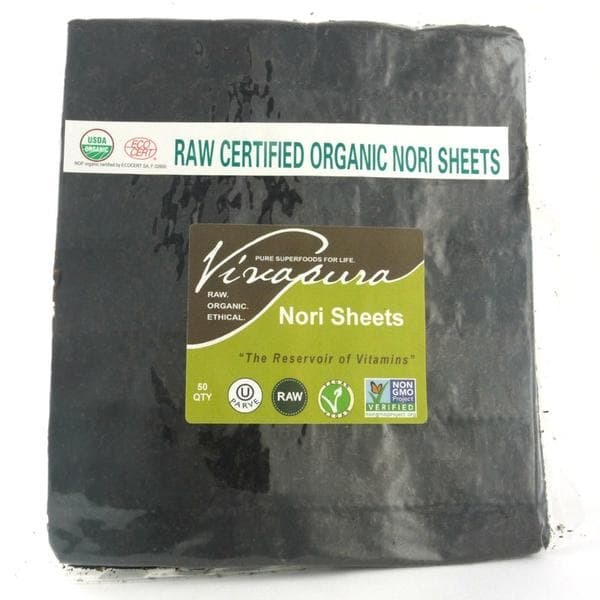 In addition, our nori sheets are also certified usda organic. Rip into small pieces and add to salads or your favorite dish. Salad Wraps: Roll with salad or sliced veggies. Nori Rolls: Add a raw nut pat (in place of rice) and sliced veggies.